COMPATIBLE WITH:for Apple ® iPad ® (5th generation), iPad (4th gen). It may not work with other tablets. Products are Apple® compatible and not endorsed by Apple, Inc. This USB charging data cable provides the ability to connect your Tablet to your compatible PC. IPhone 5, iPhone 5S, iPhone 5C, iPad Mini, iPod Touch 5, iPod Touch 6, iPad 4, iPod Nano 7, iPad Air, iPad Mini, iPad Mini 2, iPhone 6, iPhone 6s, iPhone 6s Plus, iPhone 6 Plus, iPad mini 3, iPad Mini 4, iPad Air, iPad Air 2, iPad Pro 12.9, iPhone SE, iPad Pro 9.7, iPhone 7, iPhone 7 Plus, iPad pro 12.9, iPad, ipad 9.7 2017, iPad Pro 12.9 2017, ipad Pro 10.5, iPhone X, iPhone 8, iPhone 8 PLUS, iPad 9.7 2018, iPhone X, iPhone Xs, iPhone Xr. 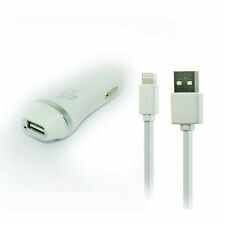 Genuine Griffin 12W PowerJolt SE 2.4A Apple Ipad Lightning Car Charger Coiled. Condition is New. Shipped with USPS First Class Package. The TabCruzer custom fit charging and locking iPad holder fits Apple iPad 4, 3, and 2. The durable plastic holder is made specifically for the iPad 4, 3, and 2 only and is not compatible with the iPad mini or iPad Air. It may not work with other tablets. Products are Apple® compatible and not endorsed by Apple, Inc. The built-in USB port allows simultaneous charging of another USB device. Small and lightweight for convenience, portability, and storage. Products are Apple® compatible and not endorsed by Apple, Inc. COMPATIBLE WITH:for Apple ® iPad ® Mini ™ (1st generation), Mini 4 3 2. It may not work with other tablets. This USB charging data cable provides the ability to connect your Tablet to your compatible PC. COMPATIBLE WITH:for Apple ® iPad ® (2017), iPad (5th generation). It may not work with other tablets. Products are Apple® compatible and not endorsed by Apple, Inc. This USB charging data cable provides the ability to connect your Tablet to your compatible PC. Protective circuit to prevent overcharging (IC chip). LED Indicator. USB 2.0 port transfers data between the device to PC or Laptop. Sync your device with a PC or Laptop with our High Quality premium data cable. Make: Just Wireless. Check with the manufacturer for more warranty information. COMPATIBLE WITH:for Apple ® iPad ® 9.7 (6th generation) 2018. It may not work with other tablets. Products are Apple® compatible and not endorsed by Apple, Inc. This USB charging data cable provides the ability to connect your Tablet to your compatible PC. For Apple iPad. Connectors: 2.0 Mini USB 4-pin male, to USB A male. Protective circuit to prevent overcharging (IC chip). LED Indicator. USB 2.0 port transfers data between the device to PC or Laptop. IPHONE 5, IPHONE 5S, IPHONE 5C, IPAD MINI, IPOD TOUCH 5, IPAD 4, IPOD NANO 7, IPAD AIR, IPAD MINI, IPAD MINI 2, IPHONE 6, IPHONE 6 PLUS, IPAD MINI 3, IPAD AIR, IPAD AIR 2. Input: DC12-24V Output: 5.0-5.5V Short Circuit Protection.